The future is history… From Samuel Peralta, creator of the bestselling Future Chronicles anthology series, comes a new speculative anthology series that turns the world you know upside down. 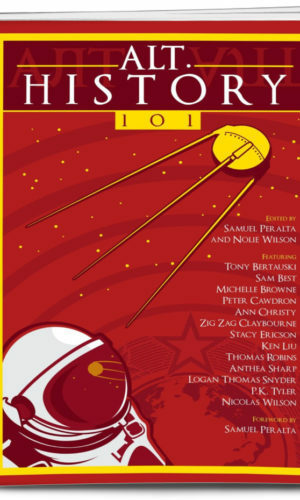 In Alt.History 101, thirteen top speculative fiction authors re-imagine the world – as one where the inventor of the smallpox vaccine died before he’d created it, as one where the women’s suffragist movement failed to win the right to vote, as one where the death penalty exists but where all forms of capital punishment are ruled inhumane – and ten other compelling stories charting the histories of these worlds. Enter worlds so much like our own, yet so different – where everything you know… is history. Would you change one thing in the past, if you could? Speculative fiction writers ask “What If?” for a mind-bending exercise of imagination in each of the short stories of this new, great collection from Samuel Peralta. Every writer’s style is different, and the stories take on different issues in varied periods of history. I enjoyed the challenge of exploring strange new worlds in this anthology. I highly recommend the book to stimulate new thoughts on how history shapes society.